Enjoying defending has been a key factor in Wakefield Trinity’s superb season so far, according to skipper Danny Kirmond. He said: “Confidence has been a big thing for us but it comes down to the effort we have put in. “We have addressed the inadequacies from last season, particularly defending our own line, and we are now confident in our defence and we are actually enjoying defending. While Trinity have enjoyed a magnificent run of results, they have also been forced to fight back in recent outings. However, the Wakefield skipper is not getting overly-concerned. He said: “We have probably been better when we have been behind and we are confident that we can get back into games. 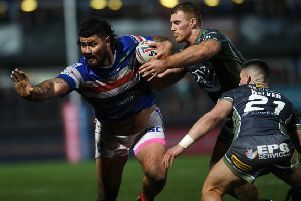 Kirmond is keen to keep his troops’ feet firmly on the ground, despite Trinity’s lofty position, but he also wants to push on. “We are not getting carried away but we are also not scared of saying we want to win and go on to achieve better things this year.